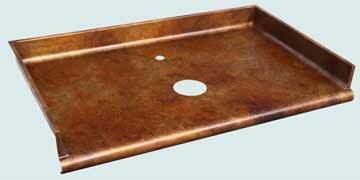 Handcrafted Metal makes exquisite copper Kitchen countertops to suit your taste and accommodate your kitchen. With us you can customize every dimension and feature. You can also add detailing, such as fancy edges, backsplashes, hammering, and drainboards, to give your copper kitchen countertop a powerful presence in your kitchen. 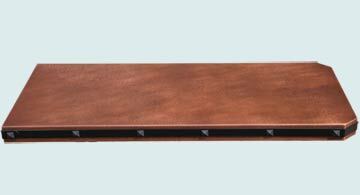 Each copper Kitchen countertop is fully welded and polished, and made with the purest copper available. 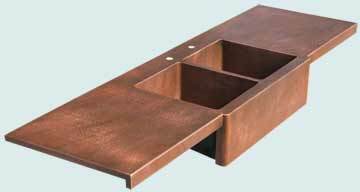 Feel free to choose how your copper kitchen countertop with or without integral sink will look, by combining our custom features into the perfect custom copper kitchencountertop for your kitchen. We will work with you to produce a work of art for your kitchen. To get started, click any of the Copper Kitchen countertops below to see pricing and customize your dimensions and features. A compact alcove top with 3 inch splashes on three sides. 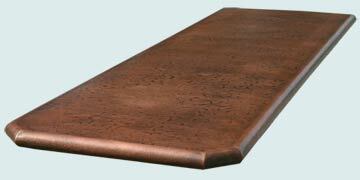 The bullnose edge gives this top a softened appearance. The larger hole is set to accept a vessel. The splashes fit tightly to the three surrounding walls, so it is an easy to clean work area. Smooth copper, Light Renoir Old World patina. Our Claire quarter-roll edge and our reverse hammering give this lav top an old, well-worn aura. 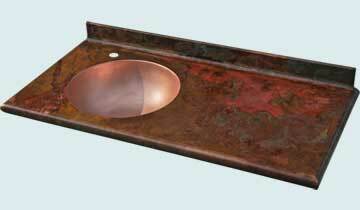 The oval sink is welded seamlessly into the deck. Our medium patina was hand rubbed to bring out the highlights, then sealed with lacquer and carnauba wax. 16 gauge copper. A delightful random hammered bar top with octagonal sink and tightly spaced bronze clavos. The repeating pattern of clavos adds a rustic appeal. 16 Gauge copper, medium antique patina with hand rubbed highlights, lacquer, and carnauba wax. This classic top is loaded with features! A marine Normandie edge on the front turns water back to the sink. The combination of the large sink in the middle, vegetable prep sink at the left, and drainboard at the right provides outstanding water control. The ribbed, sloped drainbaord provides positive drain action for drying dishes. There is plenty of work area, too. Smooth copper, light antique patina. This copper top features decorative clavos on the edge and is fully textured with our "Random Hammering" technique. It's made from the purest copper available, and is antiqued with our "Medium Patina" finish. 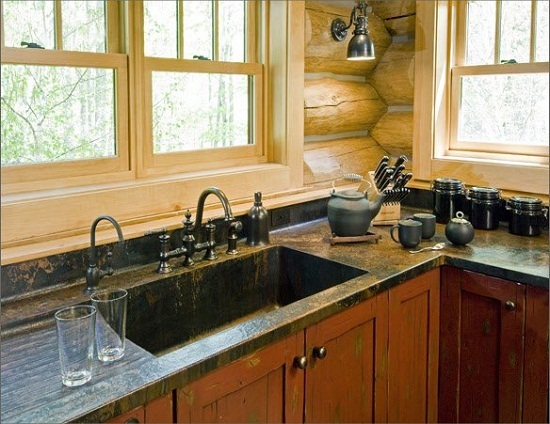 The deep, subdued colors of this Old World patina give this countertop the feeling of exotic old wood. The extended front is especially prominent to cover a large jogforward of the cabinet below. The edges are slightly taller than usual at 1 3/4 inches. Smooth 48 ounce (16 gauge)copper, Ochre and Burnt Umber Old World patina. Our Rose and Gold Old World finish provides life to this simple countertop. Smooth copper, Rose and Gold Old World Finish. 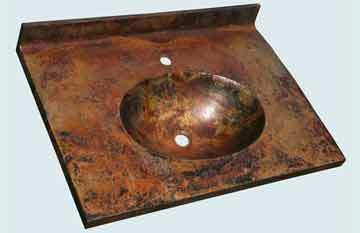 This stunning distressed texture copper countertop features scrolled fronts on the splash. Th 5 1/2" Monterey edges on all 4 sides and the bare semigloss finish combine to produce the aura of many years of hard use. This bar is exposed on all sides which required that the splash be closed on the back side. Heavy-distressed copper, bare semi-gloss finish. A very simple, durable, and economical countertop. The reverse hammered finish resists scratches and other kinds of wear. The Mon Ami edge is only 1 7/8" tall, making this top perfect to glue down over existing countertops. Reverse hammered copper, medium patina. An interesting front line develops with the corner posts and forward placement of this apron & large sink. The recessed front edge gives this countertop strong defining lines. The short back splash keeps water off the wall. Smooth copper, medium antique patina. 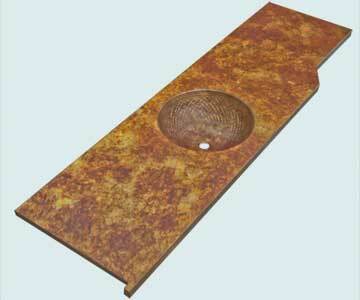 This two-sink lav top features integrally welded embossed oval sinks for a decorative accent to the rustic deck. This customer choose the Native Dancer sinks, but all of our decorative sinks are available to weld into custom tops. The random hammered copper top has our medium antique patina. The sinks were antiqued to match. This countertop is fully reverse hammered and features a welded integral hand hammered bar sink. The two hammered textures provide an interesting contrast. The coved back splashes have a 1" return at the top. Reverse hammered 16 gauge 48 ounce copper, medium antique patina. 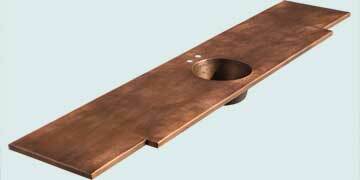 A very simple copper lav top that fits next to the wall. The integral oval sink is hammered and finished to match the top. The finish is our Canyonlands rustic patina over reverse hammered texture. 16 Gauge copper. This extra tall 20 inch splash fully covers the back and side walls of a shallow alcove. 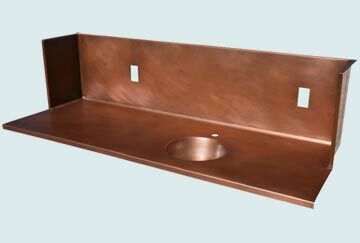 The sink is an integrally welded smooth copper basin. We pre-cut the two electrical outlet holes to allow simple installation. Smooth copper, medium antique patina. This reverse hammered bartop has an angled corner at the left front, and a wall notch on the right end. A large, open eating area that overhangs on 3 sides. The rear adjoins a raised bar. This very large top required a full length deck weld. The weld runs parallel to the rear edge about 12" from the back. The reverse hammered finish provides an aged, textured quality and our medium patina finishes with our warm caramel color. 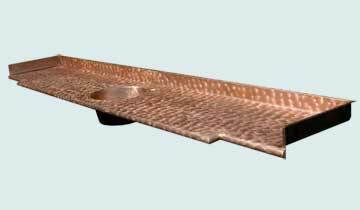 This reverse hammered countertop features 2 angled corners and round cast bronze clavos. The reverse hammered finish is durable and scratch resistant. Reverse hammered copper, medium antique patina. This practical countertop features our Normandie no-drip marine edge on front and ends. The reverse hammered deck, integral 8-sided hammered sink,and integral backsplash make a great combination for a high-durability wet area. Reverse hammered copper, medium patina. An elegant embossed braid pattern edge accents this small countertop. The smooth copper top provides an appealing contrast with the strong texture of the braid edge. 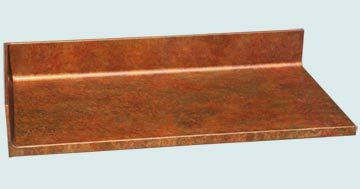 This exceptional copper top features 2 integral oval sinks, reverse hammering, and Claire quarter roll edges. The coved backsplash makes cleanup easy. Deck finish reverse hammered. Sink finish random hammered. Medium antique patina. The integral splash on this top came up 20" to meet the bottom of some cabinets. Left and right sides are raw to touch a wall, and the integral bar sink is 15" x 15" and 8" deep. Everything has medium antique to age the 48 Ounce copper. The butterfly finish gives this countertop and sink a bold pattern and whimsical feel. 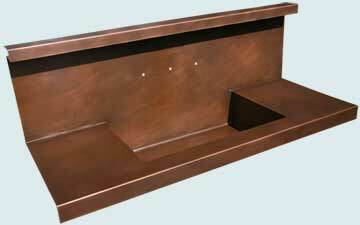 The bullnose front edges follow the cabinet base front profile. The drum-style sink is integrally welded into the deck. Backsplashes protect the wall. The peach color will turn darker brown over time. Smooth copper, butterfly finish, natural copper. We asked our customer for a template of the sink that was being installed under our top. This ensured that the framed opening around the farm sink fit like a glove. Some folks send us the sink. We drilled the faucet holes behind the sink with the information provided to us. The 48 ounce copper top is welded and polished. The medium antique gives the piece some age. The fabulous Old World patina is the best feature of this top. The 3 inch backsplash keeps splashing water off the back wall, and the integral round sink is smooth copper finished in a natural color to contrast with the colors on the deck. Bullnose edges are about 1.5" tall. 48 ounce copper is fully welded and polished. Handcrafted Metal takes pride in our very high quality craftsmanship. 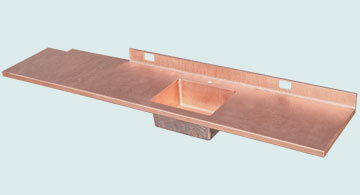 We see your Copper Kitchen Countertops order as an opportunity to deliver our uncompromising design and craftsmanship. 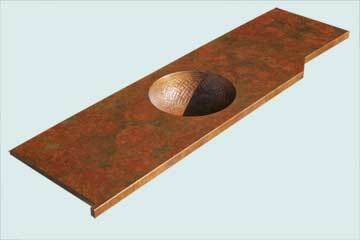 You can see that we offer a large number and an amazing variety of custom copper kitchen countertops designs. Our 25 years of experience in building kitchen counters tops in every size, shape, and color gives us mastery of the essential methods, processes, and skills needed to produce a copper kitchen top that exceeds your expectations. 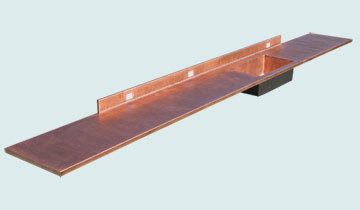 We have built thousands of Copper Kitchen Countertops. The vast array of styles, finishes, textures, and metals available for Handcrafted Metal Kitchen counter tops provide almost unlimited choices. 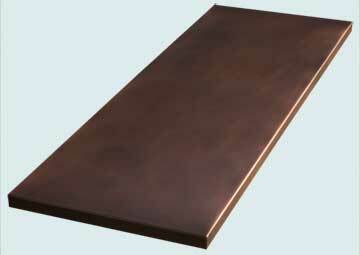 We offer an extensive selection of Copper Kitchen Countertop styles. 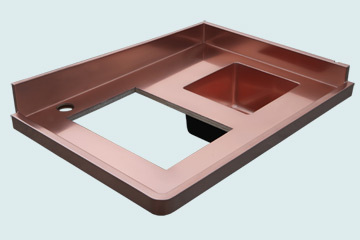 Just browse the Style to see wide range of custom copper kitchen countertop products with the options of integral sinks. 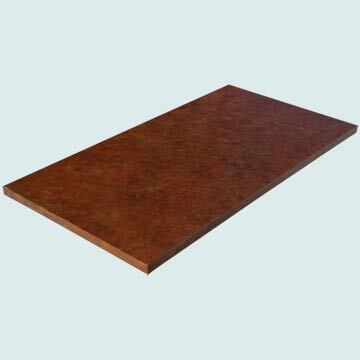 We are glad to answer any questions about any of our Copper Kitchen Countertops. Call 1-800-755-0310 to speak with a product specialist who will help you select and configure your ideal custom copper kitchen top. Handcrafted Metal Custom Copper Kitchen Countertop and Kitchen top are built in a way to be the focal point of your kitchen or Bar.